John Zappia presented the Striker Top Doorslammer Monaro at his home track last weekend for the spectacular Top Fuel two-day event. Competing in the local “Top Comp” competition, Zap and his crew were back testing the new clutch combo but most of the runs ended up hazing the tyres for the ¼ mile, or blowing off the tyres completely and forcing Zap to pedal repeatedly. “First run Friday night just blew the tyres off on the hit and I rolled through for a 7.166et @ 209.79mph. We took everything out of the clutch and the second pass slipped the clutch all the way to a 6.058et @ 237.46mph that put a smile on all our faces, especially as I had a slight pedal half way through first gear. That placed us third in the qualifying list at 0.462 under our index of 6.520”. “On the Saturday afternoon we tried another two passes but the Rat just stood up on the tyres and hazed them for the quarter! A 6.581et @ 231.95mph and 6.646et @ 222.77mph were the results”. 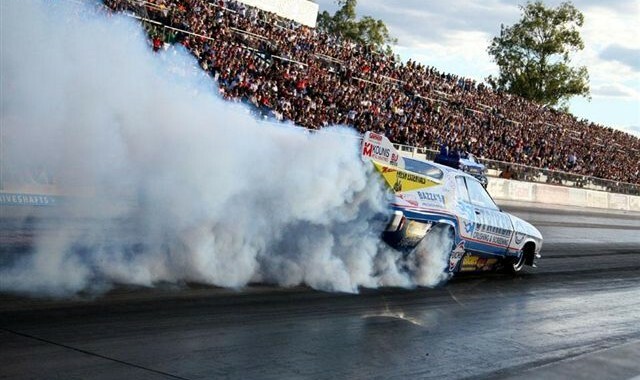 John Zappia lived up to his reputation as a wild driver, with big long smoky burnouts and efforts to control his 3,000 horsepower monster that had the local crowd smiling. The Striker Monaro in 5-second form now looks relatively sedate on a run, but the crowd quickly remembered the three years of wild and crazy driving (including hitting walls) it took to get the HQ to that stage of development. Zap remains the crowd favourite at his home track. Quick man John Zappia fronted the Perth Motorplex for the “USA Jets” National Open meeting with his Striker Top Doorslammer Monaro last weekend to compete in Top Comp, and took out the B Final trophy. Racing on the weekend continued further clutch development, with qualifying passes in the afternoon of 6.544et @ 222.77mph and 6.218et @ 232.55mph with wheel spin off the line. The passes put Zap 7th in the qualifying list 0.202 under his index. 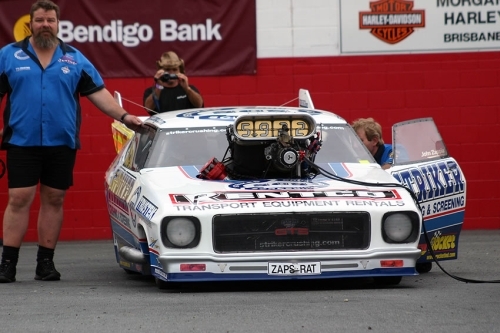 First elimination final was up against Darwin competitor Mathew Abel in his Hemi powered AA/G Capri. Zap took the win with a 6.141et @ 232.55mph against Abel’s red lighting 6.637et @ 202.70mph. The next round competitor was Aaron Deery in the Top Alcohol dragster, which did not front due to damage. Rather than risk the engine, Zap staged the car for the B Final win. “I had run the car on seven cylinders before after a lead was left off, and the crank ended up breaking in two and damaging the block, so I did not want a repeat of that. We were happy to collect the win and maintain top spot in the GT Radial Tyres Top Comp championship”. Zappia Racing hired the track on the Sunday following the meeting, and carried out further testing on the clutch setup. John Zappia won Round Three of the ANDRA Top Doorslammer Championship at Kwinana Motorplex this weekend with a stunning array of low et passes that blitzed the thirteen car field. Zappia top qualified with a 6.025et @ 239.36 with two of the three qualifying runs available. 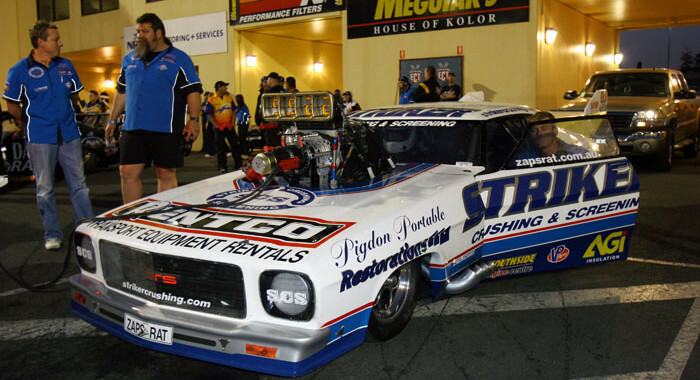 The Striker Monaro top qualified on Friday night with a 6.025et @ 239.36mph after a first pass of 6.087@236.84. Weather interruptions forced the third qualifying session to be cut short, and teams were offered a last session on the Saturday afternoon at 3pm. First elimination round was a safe straight 6.051et @ 238.72mph pass for Zap to take the win over Robyn Judd’s 6.173et @ 241.28mph. Second round saw Zap get more serious in his tuning, thrilling his local crowd with a 5.956et @ 239.36mph win over Ben Brays tyre shaking 6.804et @ 163.33mph. John Zappia now leads the ANDRA Top Doorslammer Championship on 343 points, ahead of Stanic on 240, Bishop on 185, Phillips on 160 and the Brays on 155 and 150 points. After rain disrupted Friday night qualifying the last few teams that did not get a chance to run were permitted to run a special 3 pm session on Saturday afternoon. After the dust settled though the qualifying order didn’t really change much with an unusually slow 6.40 bump for the Doorslammers. Regardless of the bump the field was packed with heavy hitters all capable of taking out the event, as long as they can knock Zappia out who has shown consistently outstanding form over the last several meetings and qualified with over a tenth on the rest of the field. Most teams struggled in qualifying without showing their best in the tricky conditions but everyone needs the points in the Championship chase so nothing will be left in the trailer. With the traditional blessing and National Anthem completed at 6pm it was time to get racing under way with the Top Doorslammers out first. Gary Phillips and Ben Bray are out first through the tunnel, some businesslike burnouts they are back and into stage quickly, both leave well but Phillips strikes a little shake around 330’ and has to peddle and the timers tell the story with a 6.36 for Phillips to Bray’s tidy 6.12 as they start to get after the tuneup. Second pair out is Steve Stanic and Stuart Bishop in their immaculate Camaro’s, Stanic and old hand at the Motorplex but struggling at recent events here. This is Bishop’s first competition lap here so it will be interesting to see which way they have gone with the tune since they qualified well ahead of Stanic. Both cars strike trouble early on though, Bishop is all over the track off the line and aborts and it’s shake for Stanic and he peddles it through to take with win with a 6.23. Later on we find out Bishop really had his hands full – the quick-release steering wheel came free on the launch! Peter Kapiris and Brett Stevens out for the third pair, Kapiris coming to grips with a new tuner on the spanners and Brett looking to turn the event around for the team with only one car qualified. True to form Brett runs through to take the win with a tidy 6.14 win after thrashing with an engine change overnight. In the other lane Kapiris has a shake around 100’ and has to peddle slowing the run to a 6.45. Final pairing out now, it’ll be Robin Judd up against top qualifier John Zappia who can play it safe and conserve the car a bit, sure enough it’s a straight and soft looking 6.05 for Zappia and a solid and well improved 6.17 from Judd however it’ll be Zappia through to the semis. Round 2 of Top Doorslammer and Brett Stevens just squeaks into the lanes after a massive thrash to replace another engine and drivetrain in Jack Daniel’s Falcon. He will be up against Stanic, so this should be a great race. Stanic is out with a wheelstand in the top of first gear and then powers straight down track for a great 6.06 to put Stevens out of action, despite a consistent 6.18 from the Ford. It looks like Brett might not have expected that from the Camaro tonight! On the other side of the ladder we have Ben Bray vs crowd favourite John Zappia, the Bray camp will have to throw everything at this to try to get past Zappia and into the finals. Ben is out with a good RT, but it looks like they’ve gone too far as the car steps out on Ben at the 330’ mark. Zappia meanwhile has it running like it’s on rails, he blitzes past Benny to run a meeting best (so far!) 5.95!!! which brought the house down as the fans went wild when the numbers flashed up on the read out borads..
With the air hovering around 170’ all eyes are on John Zappia who announced his intention to reclaim the world Doorslammer record, currently held by an American at 5.912. Zappia will need a 5.911 or better, the air is certainly there to make the horsepower but will they be able to stick it to the track? Strong burnouts from both cars and there’s a lot of ice on Zappia’s hat in the dense air tonight after the long back up. Zappia out on the green with a much improved RT but still not match for Stanic’s lightning 0.058. The Monaro doesn’t stick as well as they hoped though and it starts to move around into second gear, a quick peddle and still manages to take the win with a 6.14. Steve Stanic meanwhile also has to peddle the Camaro and runs through for a 6.58. On Saturday John Zappia beat legend Victor Bray in the final of the East Coast Nationals at Western Sydney International Raceway, Sydney Australia to win Round 1 of the Australian ANDRA Top Doorslammer Championship – with a five second pass! Zap has to be close to being proclaimed the formost alky doorslammer tuner in this country, with performances of 6.036, 5.988, 6.031, 6.006, and 5.965 demonstrating mastery over the difficult PSI blower and lock up clutch combination used here in Australia. No other team came close to that sort of consistency, but several racers notified the class that their performances are approaching the magic five second zone. “We are now looking forward to round 2 of Top Doorslammer at Willowbank for the 42nd Australian Nationals in 2 weeks time (14-16 Sept) where we will lock horns with Victor on his home track and another top field of Doorslammers. We hope to repeat the results of this weekend and would love to see as many of our sponsors, friends and supporters at Willowbank to cheers us on”. BRING ON THE 2007/2008 SEASON! Top Doorslammer 2006/2007 Championship Runner-up John Zappia and his Zappia Racing Team are in Sydney, Australia well prepared for the new season opening round of Top Doorslammer at the AC Delco East Coast Nationals, hosted at Western Sydney International Raceway. Nestled inside the Zappia Racing pit area is the most potent sedan car in the country – the Striker Top Doorslammer Monaro. World record holding, and still the quickest doorslammer in the land of Oz with the ANDRA National Record certificate proudly hanging on Zap’s wall at home, the Striker Monaro now has the potential to go even quicker. John Zappia will be competing against nineteen other fierce Top Doorslammer teams on Friday night eliminations, all fighting for eight spots in the elimination rounds. John Zappia was all smiles this week after reflecting back on his 2006/2007 Top Doorslammer racing season, and his stunning win at the Winternationals last week. Zap finished second in the Championship with 521 points, 19 points behind Garry Phillips 540 points who managed to secure his championship with a strong qualifying effort. The Winternationals final was between young Benny Bray and mister consistent quick man John Zappia at a later than planned 8.39pm – allowing the air to come around nicely for both teams. Round 7 – Winternationals. Top Qualified with a 6.031. Wins event with a 5.996 and Lowest Elapsed Time. Round 6 – Tin Tops. Top Qualified with a 6.082. Meeting abandoned due to rain. Event Lowest Elapsed Time. Round 5 - Westernationals. Top Qualified with a 6.064. Semi Final finish – clutch failure. Event Lowest Elapsed Time. Round 4 – Summernationals. Top Qualified with a 6.040. Semi Final finish. Round 3 – Goldenstates. Top Qualified with a 5.922 – resets World Record. First Round finish – mechanical failure. Event Lowest Elapsed Time. Round 2 – Australian Nationals. Shut down in First Round due to body defect. Round 1 – East Coast Nationals. Top Qualified with a 6.08. Wins event and Lowest Elapsed Time. John Zappia produced a winning performance in qualifying at the Tin Top’s in tropical Queensland on the weekend, with super consistent runs in all three sessions – only to be beaten by the rain before the first elimination round. The rain persisted, and the event was cancelled by Willowbank staff. With a minimum 40 points awarded to all qualifiers (and Zap awarded Low Elapsed Time extra 5 points) under ANDRA rules for the Tin Tops, the Championship remains in the hands of Garry Phillips (500 points). All Phillips has to do is qualify to win the Championship. Best case scenario for Zap (416 points) would be for Phillips not to qualify, and to win the event for 100 points and gain 5 points for Low Elapsed Time – winning the championship by 1 point. We hope to see as many sponsors, friends and fans come to Willowbank to hopefully celebrate the end to a very good season. John Zappia heads across the Nullabor this week to attend the QT Tin Top Titles on 28th April 2007, to contest Round 6 of the ANDRA Top Doorslammer Championship at Willowbank Raceway. Zap’s Rat holds the title of quickest and fastest Tin Top in the world, a time of 5.922 seconds ET, and a speed of 242.28mph, and boasts an all steel body over the Anderson chassis, with extensive suspension modifications by Zappia Racing and assistance by Santhuff shocks and struts. Zap’s Striker Monaro – Australia’s Quickest Top Doorslammer – comes off two rounds of local track competition and testing, that saw the new Striker PSI/TFX engine combination crack the five second barrier on its third pass with a 5.991et @ 235.60mph. A win in the Top Comp B Final last meeting with a 6.093et @ 235.60mph consolidated the effort, after minor engine changes were required to fine-tune the package. Gary Phillips leads the Top Doorslammer championship with 460 points, followed by John Zappia on 371, Brett Stevens on 363, Victory Bray on 360, Peter Kapiris on 300, Steve Stanic on 270 and Robin Judd on 208 points. With Kapiris and Stanic sitting out the Tin Tops, the race is between the top four giants of Top Doorslammer racing to win the championship – all crowd favourites. 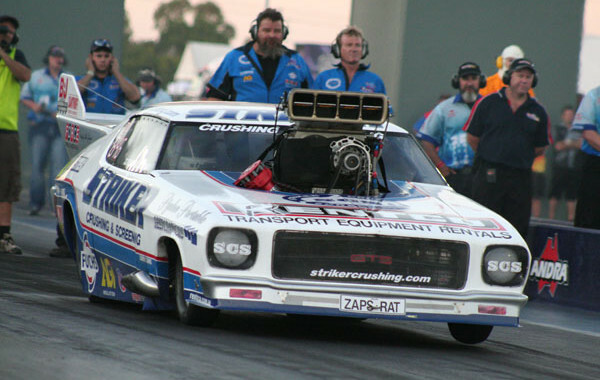 John Zappia has his Striker Monaro finely tuned after years of regular testing at the Kwinana Motorplex, but it was not always that way. The car suffered handling problems early in its development, and was a wild ride at times – hitting the wall numerous times and thrilling the crowd with Zap’s spectacular driving skills. Zap drew on the experience of USA teams and Santhuff to make the necessary changes to achieve the jump in performance. John Zappia – wild man from the west – drove his race of the season today at the Winternationals, defeating Benny Bray in the Final in his Striker Monaro to take out the ANDRA season closer. And he did it with a five second pass! Zap was on a mission to win the Top Doorslammer Championship this weekend, needing to top qualify and win the event to stand a chance. Well he did both of those, but Garry Phillips was on his game by qualifying to take out the 2006/2007 Championship. Qualifying was over two days, and many teams struggled to come up with a tune and setup to post reasonable times. But the Zappia Racing Team were super confident the car would be consistent, and the results speak for themselves. A 6.122et @ 236.72mph first pass with a pedal, 6.031et @ 234.50mph second, and 6.252et @ 232.56mph third on a slippery track was enough to gain top spot out of twenty one Top Doorslammer teams. First elimination round saw Steve Stanic roll through the beams to hand the win to Zap, although a 6.031et @ 235.73mph run in the HQ gave Zap lane choice in round two. Second elimination round saw the race of the Winters – Legend Victor Bray up against the in form five second man John Zappia. “Victor Bray now takes on John Zappia…Victor has appeared in every Top Doorslammer Winternationals Final except for one since the inception of the bracket…talk about battle of the burnouts Zap takes it to half track…Bray says I can do better than that and burns on right past him…Will we see a five from Zap or the Big Vic taking his place beside his son in the final, this is gonna be awesome, they are both out, Bray is in front, but Zap comes back and snatches the win at the line.” wrote the track commentator. A 6.031et @ 235.97mph by Zap was enough to beat a stout 6.04et @ 241.42mph from the big man. The Castrol Edge 2007 Westernationals final was between young champion Benny Bray, versus experienced champ Zap. “Talk about tyre torturing burnouts, John Zappia and Benny Bray are taking it right up to the crowd with massive side by side burnouts, there is a staging duel, they are out, Ben is just in front but here comes Zap and its massive – he is drifting towards the centre line, he hangs onto it and it’s a five second pass by Zappia for the win.” A 5.996et @236.97mph was enough to beat Benny’s 6.091et. This last event was all Zappia’s, after a mixed season saw him lose valuable points towards the championship. The win gave him his second Top Doorslammer runner-up title, and a $5,000 bonus from Striker for the five second run, but sent a strong message to his fellow competitors and fans that next season is the season to catch John Zappia and the Striker Monaro. Results thanks to Willowbank International Raceway. come and Sutton is far from safe. and both shut off before mid track. the air, it ain’t fast but it sure is entertaining. the line, but he manages to hit fifth spot. the bottom end. Bishop is out in front. get out of it, tyre shake right off the line. has thrown V Bray to the outside but he is yet to come. spot, but the Boss yet to qualify. to get into the field. and he bumps into number five spot. were just not hot enough. many more that can come around him. outside looking in. Remember, a 6.258 is the bump. officials. We’re down for a clean up. Phillips in Round One of Eliminations. line won this race for Ben Bray. line and Victor has the win. is on a great run to the final. pass by Zappia for the win. 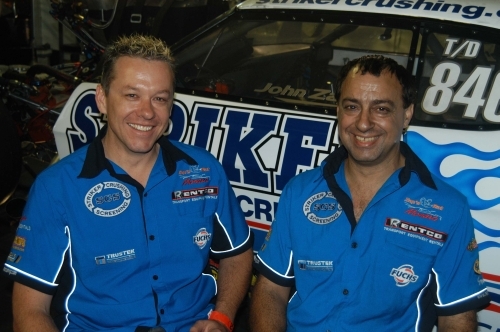 John Zappia is counting on some luck that has avoided his team this season at the Castrol Edge 40th Winternationals held at Willowbank Raceway, the final round of the ANDRA 2006/2007 Top Doorslammer Championship. A total of 21 teams have entered for the event, battling for eight qualifying positions on Friday and Saturday to make it through to Sunday’s eliminations. “We can win the championship, but under the most trying of circumstances”, said Zap. “It has been known to happen in drag racing before, and we as a team are pretty pumped – especially after our recent news release. My move to professional racer status in the sport is a dream come true, and building and racing a second HQ Monaro for Striker director Craig Pedley will make good use of our knowledge”. “If we win the event and get quickest et, and if Phillips fails to qualify – then we win the championship by one point. Phillips is a seasoned and tough competitor, so we do not underestimate him, but he has had lucky breaks this season and we are interested in what his strategy will be in qualifying. These qualifying sessions should be the most exciting two days for Doorslammer fans, and we will give it a serious go each session. It would be nice to top qualify with a five”. “The Striker Monaro can beat any car in Australia on this track. We have completed some minor maintenance work after the recent rained out Tin Tops here in Queensland at the Striker facilities. Our private testing day after the Tin Tops showed we are on the pace at this track – with a 6.01et, after a trio of “O’s’ in qualifying – 6.098, 6.082 and 6.083et’s”. Once again Zap and his crew invite fans to spend some time at the Zappia Racing pits area, where you can have a chat to any of the team, or take some photos of Zap’s Rat. A full range of merchandise will be on sale, and Zap will be available to sign items with a personal note. John Zappia silenced all skeptics at the Perth Motorplex yesterday, when the Striker Top Doorslammer Monaro fronted for a local meeting with their new Striker engine combination, and promptly ran a five second pass after a test run, and first full pass of 6.057. The TFX block, with the latest Randy Anderson heads (never raced in Australia), and a brand new PSI blower is John Zappia’s first ever brand new engine – after over 20 years of drag racing. “Thanks to Striker Crushing and Screening, we were able to custom order all brand new parts to put this combination together. It’s a dream come true for us local sportsman racers, who have always had to purchase hand-me-down second hand engines and blowers from the US.” said a jubilant Zap last night. 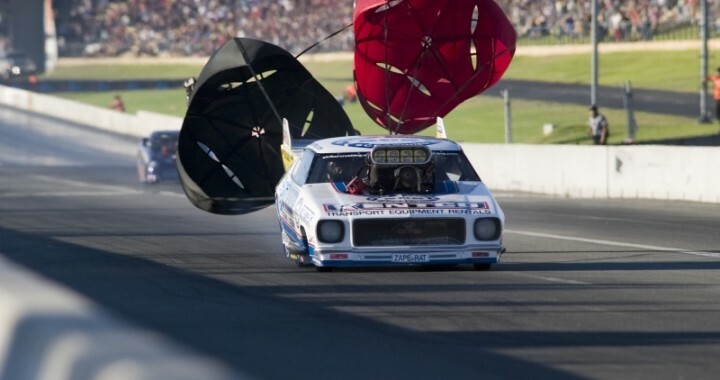 “People think we made a strategic decision to run with the Whipple blower, but it was nothing more than a budget decision for us at the time, and to have achieved all our world records with second hand gear highlights the depth of knowledge we have in our team. The PSI gives us weight advantages, and it appears to make more power and torque than the Whipple”. Observers were commenting that Zap will take months and dozens of laps to sort out the awesome performance of the PSI equipped BAE – after all, most of his Australian Top Doorslammer competitors have had years to sort out their PSI combinations and still struggle with their tune ups. But after a shake down pass to gain some data, the team set Zap’s Rat up for it’s first full pass and rattled off a dead straight 6.057et @ 234.37mph. “It was fat and lazy, but showed us the real potential of the combo” said Zap. Zappia Racing earnt valuable dollars from Striker Crushing Managing Directors Chris Lane and Craig Pedley, who handed over $5,000 as part of a performance bonus. “Every time the team runs a five, we hand over a cheque for $5,000 as an incentive.” said Chris Lane, “We are very proud of Zap and his team with their achievements so far, and we may extend and ramp up our Motorsport program with the team in the future..” Craig was relieved that the team didn’t make the last pass as it would have cost Striker Crushing another $5000, especially as the air was at it’s best of the weekend. Zappia Racing will carry out further testing and racing on April 14th at the Perth Motorplex, before heading to Queensland for Round 6 of the Australian Top Doorslammer Championship “Tin Tops” event on 28th April. John Zappia is second in the championship point’s table, behind veteran Garry Phillips, and is counting on a strong performance at the event. John Zappia gained valuable points for the ANDRA Top Doorslammer Championship at the Westernationals held last weekend at Perth Motorplex in Western Australia, with a Semi-final finish. The Striker Monaro was unable to continue the Semi-final pass against arch rival Garry Phillips, after the clutch failed reversing from his traditional long smoky burnout. Several racers encountered problems this weekend – Ben Bray failed to qualify in his new Monaro, Steve Stanic was disqualified in Round 1 Eliminations due to his front air dam being too low for the stage beams, and several teams suffered terminal engine damage. Zappia racing will now contest two local rounds of racing at the Perth Motorplex where further testing of new components will be carried out. Round 6 is scheduled for 28th April at Willowbank Raceway with the running of the Tin Top Championships – a unique event featuring all forms of slammer racing. 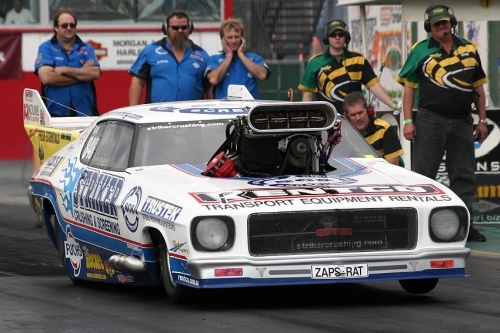 John Zappia is one of the most renowned names in drag racing, yet he still has a monkey to shake off his back in Top Doorslammer racing at the Westernationals, to be held this Saturday and Sunday at Perth Motorplex. The 45 year old Spearwood man is driving the world’s quickest Top Doorslammer, holding the record at 5.92seconds for the quarter-mile but his speeds of 380kmh do not come easy. “We’ve never had good luck and have always had the stupid things go wrong at the Westernationals, he said. The Australian Top Doorslammer Championship is up to its fifth round and Zappia is sitting third, behind Queensland racers Gary Phillips and Victor Bray. Perth Motorplex has attracted a record field of 15 cars from across the nation to compete and Zappia sees himself with a big advantage at the Kwinana track. “We do nine events a year in Perth and always in different race conditions,” he said. In an aggressive tactic, Zappia has slotted his world-record, 3500 horsepower supercharged V8 back into his Monaro Top Doorslammer. “The field is pretty good but I need to concentrate on not beating myself,” he said. Zappia will be challenged by his championship rivals Phillips and Bray, as well as Victoria’s Peter Kapiris, New South Wales’ Steve Stanic, Queensland’s husband and wife team of Brett and Kath Stevens, Victor and Ben Bray and fellow West Australian contenders Robin Judd, Gary Stevens and Adam Croker. The event will also feature round five of the Australian Top Bike Championship. The big guns hit the track from 6pm on both Saturday and Sunday.